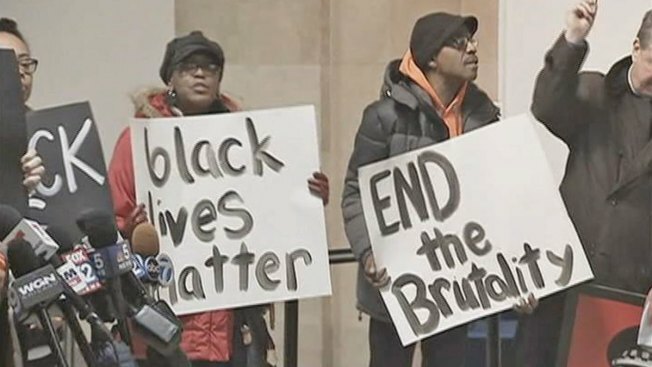 About 50 activists staged a die-in at City Hall Tuesday morning and demanded a meeting with the mayor to discuss alleged police abuse, including the allegations of illegal detainment and abuse at the Chicago Police Department's Homan Square facility. Police kept most of the peaceful protesters in a public area, but at least one woman was able to get past security before being stopped and pulled aside. Three people were cited for disobeying police orders, but police said they protected the activists' right to assemble. "The Chicago Police Department will always protect residents' right to free speech and peaceful assembly," the department said in a statement. "As you have seen over the past several years, protests have all been peaceful, and CPD goes to great lengths to ensure protesters' First Amendment rights, even shutting down major streets in some cases for demonstrations." The religious and neighborhood leaders, citing the Homan Square facility, said they want Mayor Rahm Emanuel to listen to them and reform the department. "We have been asking the mayor for over four months to just meet with us and listen to this issue, listen to the people, but he has chosen to ignore our communities," one activist said. "He has ignored the police brutality that's happening every single day. He's ignored every single person in this room. So today we demand action." As some tried to meet with the mayor, others fell to the ground to symbolize the victims they say have been beaten by Chicago police officers. The activists said they want an overhaul of the Independent Police Review Authority, changes made to the department's body camera pilot program, and an end to the practice of "stop and frisk." The ACLU of Illinois on Monday issued a report that indicated black citizens are more likely to be subjected to "stop and frisk" than any other race. The coalition of activists later issued a statement saying the mayor agreed to meet with them before the April 7 runoff election. "This happened only after months of calls, letters, demonstrations and after three people were arrested today for trying to meet with their elected mayor," they said in the statement.